1. In a small saucepan, combine the sugar, water, mint and lime zest over medium heat. Bring to a boil, reduce heat, and simmer for 5 minutes, stirring occasionally, until the sugar has dissolved. Remove the pan from the heat and allow the syrup to cool for 20 minutes. Strain before using. 2. 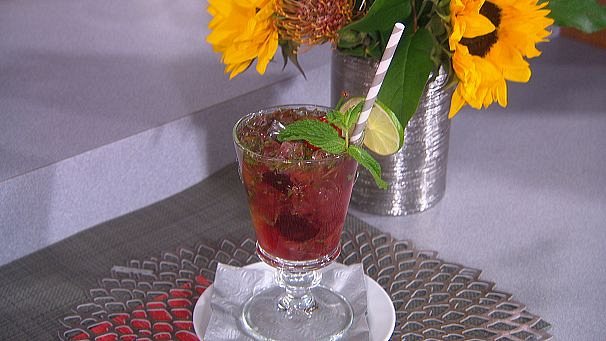 Place the frozen cherries, crushed ice, mint leaves, lime juice, rum, and simple syrup in a blender. Blend until smooth. 3. Pour the mixture into chilled glasses. Garnish with lime wheel, fresh cherries, and lightly tapped mint top.